BetaSwage is leading the hose assembly industry with its patented, market leading – CloverLeaf technology. The problem with conventional swage presses is that when they are required to swage at high forces, they become undependable and can eventually fail. The stresses for a ‘point contact’ design in the typical cone design are much higher than in the CloverLeaf profile, as shown in figures 1 and 2. 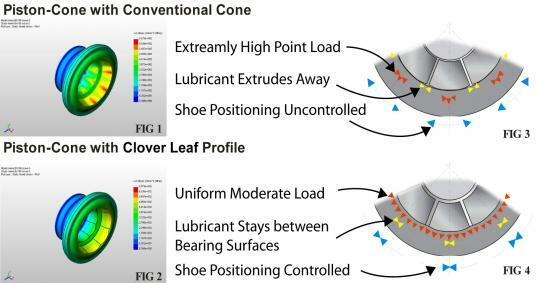 Figures 3 and 4 show other drawbacks of the cone arrangement, with lubricant moving to the side and no control over shoe positioning. While the ‘Scissor Design’ has been introduced to combat some of these issues, it is a more complex design, requiring more metal and costing significantly more money. A Betaswage CloverLeaf swage press offers all the advantages of the ‘scissor design’ but at a reduced cost and complexity. The added benefit of CloverLeaf is that full contact between shoe and piston cone is available during the entire swaging process. Pleasingly for our clients, not only is this patented design cheaper to manufacture than the typical cone design, it also offers greater mobility. So much so that we have produced variations in 12 and 24 VDC, along with 220 VAC single phase.